Vinegar stands as a highly appreciated fermented food product due to several functional properties and multiple applications. This work focuses on vinegar production from fruit wines derived from fruit concentrates, to attain a food product with nutritional added value. Four fruit vinegars (orange, mango, cherry and banana), were produced and characterized, with total acidities of 5.3 ± 0.3% for orange, 5.6 ± 0.2% for mango, 4.9 ± 0.4% for cherry and 5.4 ± 0.4% for banana. Acetification showed impact on aroma volatiles, mainly related to oxidative reactions. 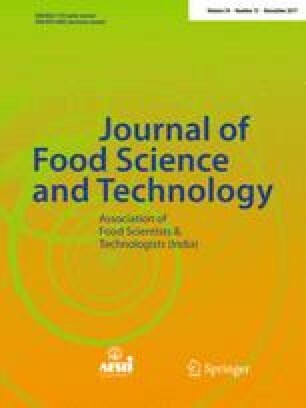 Minor volatiles associated with varietal aroma were identified, monoterpenic alcohols in orange vinegar, esters in banana vinegar, C13-norisoprenoids in cherry vinegar and lactones in mango vinegar, indicating fruit vinegars differentiated sensory quality. Total antioxidant activity analysis by FRAP, revealed fruit vinegars potential to preserve and deliver fruit functional properties. Antioxidant activity of fruit vinegars, expressed as equivalents of Fe2SO4, was of 11.0 ± 1.67 mmol L−1 for orange, 4.8 ± 0.5 mmol L−1 for mango, 18.6 ± 2.33 mmol L−1 for cherry and 3.7 ± 0.3 mmol L−1 for banana. Therefore, fruit vinegars presented antioxidant activity close to the reported for the corresponding fruit, and between 8 and 40 folds higher than the one found in commercial cider vinegar, demonstrating the high functional potential of these novel vinegar products. Authors would like to acknowledge the financial funding of: FruitVinegarDRINK QREN Project (Ref. 23209), Project “BioInd—Biotechnology and Bioengineering for improved Industrial and Agro-Food processes, REF. NORTE-07-0124-FEDER-000028” Co-funded by the Programa Operacional Regional do Norte (ON.2 – O Novo Norte), QREN, FEDER and the FCT Strategic Project Pest OE/EQB/LA0023/2013. Authors would also like to acknowledge the participation of Mendes Gonçalves S.A. and Frulact S.A. staff, for the active input, which led to the work basis and rationale.